Login or Become a Dealer to see wholesale price! Why a True Small Dual Battery Kit? The recent explosion in the electrical accessory marketplace has brought the previously seldom discussed topic of adequate power supply and reserve to the forefront. As a dealer the consumer is counting on you for the knowledge about the vehicle that allows them to make an informed decision in their purchase. To make sure it is properly equipped to address their desired use. If you do not explain the need for additional electrical reserve capacity via a second battery and the appropriate isolation equipment then you deserve to bear the blunt of that customers anger and dissatisfaction when it leaves them stranded or unable to use their vehicle. 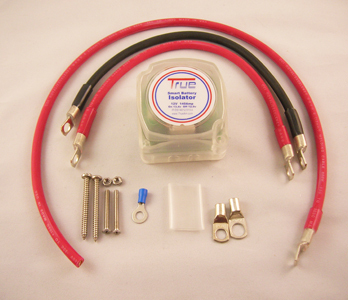 True Amalgamated, Inc.'s Small Dual Battery Kit is the single most efficient way to avoid these issues. 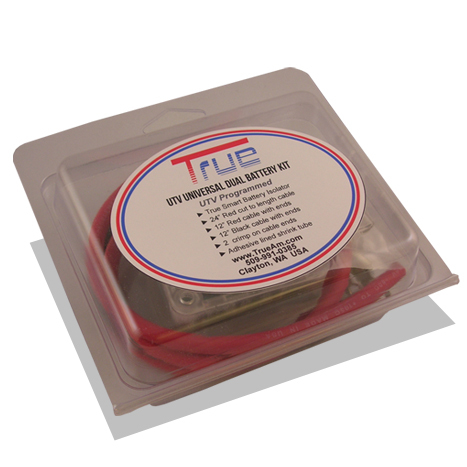 The True Small Dual Battery Kit provides for close proximity installation with a universal means of isolating the second battery to insure that the vehicle always has a fully charged primary battery to supply vital starting and engine functions while still making full use of the vehicle's available charging mechanism to keep both batteries charged when the voltage is available. The simplicity is unmatched and security it provides is, to say the least, comforting. Polaris, the largest UTV manufacturer in the industry, realizes the need for extra power and reserve and demonstrates that by building every unit with a second battery compartment as standard equipment. To go a step further they even made an attempt to provide a means of installing the second battery by means of the Polaris Dual Battery Kit. Unfortunately the product suffered from design flaws and ended is a dismal failure. This is where TrueAm came into the picture. 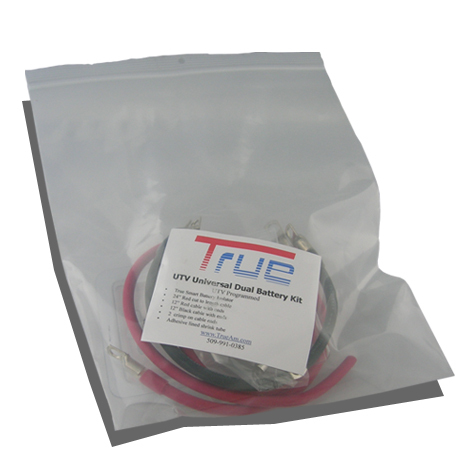 Starting with our existing Smart Battery Isolator we used immediate and direct feedback from UTV owners to adjust and redesign the Smart Battery Isolator to deal with the unique and specific needs and requirements of the stator based charging system in all different types of vehicles. 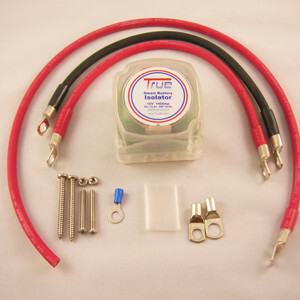 We put the True Smart Battery Isolator together with the most appropriate length cables and connectors to offer the True Small Dual Battery Kit. Prior to the introduction of our new UTV-SBI-18 and family of installation kits this was the only unit on the market directly designed to work with these types of vehicles. All cable lugs are professionally crimped and sealed with clear adhesive lined shrink tube allowing visual confirmation of seal. The True UTV-SBI-CK and UTV-SBI-CM are the newest available and are designed from the case up specifically for UTV application. Our kit comes clam-shell packaged for retail display or bagged for dealer installation. Prices Include shipping anywhere in the US. The quantity discounts will occur automatically in your shopping cart. We were founded in the desire to get products into peoples hands that make their life just a little bit better. To break through the barriers of mega-manufacturers and distributors and downsize things in a good way. To listen to people involved first hand in different aspects of work and recreation to discover those things that are missing. To devise a way to create the availability of these unique but simple little things that someone can depend on and allows them to simply relax and in so doing allows us to relax and enjoy similar things in our lives.